The Liverpool boss reckons it wouldn’t go down well if he adopted a similar approach. Klopp with Mourinho in the foreground. 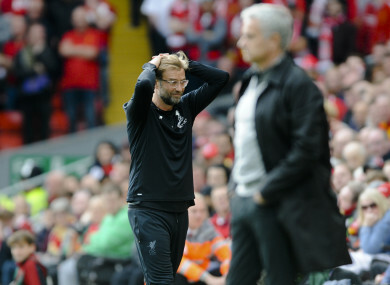 JURGEN KLOPP CRITICISED Jose Mourinho’s reserved tactics during Manchester United’s 0-0 stalemate with Liverpool today. Having landed just one shot on target throughout the game, Klopp told Sky Sports that “Man United came here and wanted a point. They got it.”, whereas Liverpool attacked the game in the hopes of getting the win. Goalkeeper David De Gea saved United on a couple of occasions, stopping an effort from Joel Matip just before the break. And overall it was United’s defense that saw more of the game, with Romelu Lukaku only getting 22 touches on the ball throughout the game. Klopp also said that he wouldn’t be a popular man if he adopted a similar approach. The German deemed Liverpool ‘unlucky’, and referred to a ‘clear penalty’ that referee Martin Atkinson failed to give. At the same time, he pulled a number of positives from Liverpool’s performance at Anfield, particularly that they kept a clean sheet. “So far we’ve only lost one Premier League game. Everyone can see we’re not far off Manchester United. I thought the boys did well,” he added. The draw leaves Liverpool seven points off leaders Man United after eight games, in a less than ideal scenario for Klopp’s men. “I said to the boys after the game, we’ve already decided to take the hard way when we joined Liverpool”, he joked. Email “Klopp hits out at Mourinho's defensive approach to Liverpool game”. Feedback on “Klopp hits out at Mourinho's defensive approach to Liverpool game”.